Whisk together the yogurt, mayonnaise, lemon juice, honey, ginger, and salt in a large bowl. Add the apples, grapes, most (but not all) of the dragonfruit, cilantro, and almonds. Toss to combine and refrigerate until chilled, about an hour. 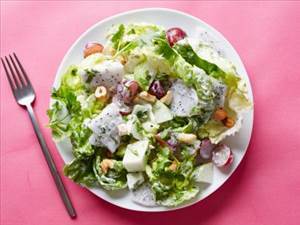 Put a lettuce leaf in each bowl and top each with a scoop of the salad. Garnish with remaining dragonfruit, cilantro, and almonds. 4 members have added this recipe to their cookbook. A yummy dish of spinach and eggs for any meal of the day. A full flavoured side dish of everyone's favourite, mashed potato. There are 125 calories in 1 serving of Dragonfruit Waldorf Salad. Calorie Breakdown: 48% fat, 42% carbs, 11% prot.